The North West LLEN Community Transition Support (CTS) is an initiative to improve school – post school pathways into further education, training, employment and community participation for young people with a disability across Melbourne’s North West. 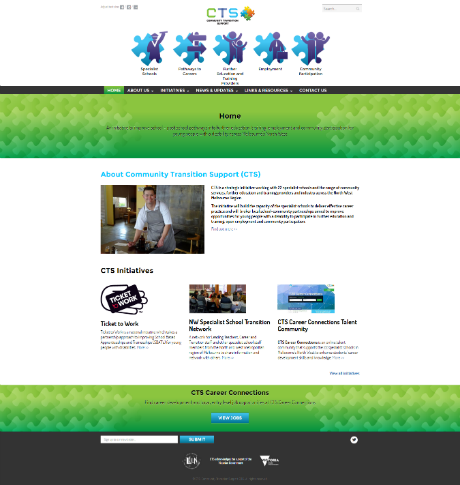 CTS is a strategic initiative working with 22 specialist schools and a range of community services, further education and training providers and industry across the North West Melbourne Region. The initiative will build the capacity of the specialist schools to deliver effective career practice and will broker local school-community partnerships aimed at improving opportunities for young people with a disability to participate in further education and training, open employment and community participation. Visit the North West Community Transition Support website for full details.